Home BUSINESS Waititu launches a sh. 200m Kiambu Jijenge Fund for business start-ups. Waititu launches a sh. 200m Kiambu Jijenge Fund for business start-ups. Governor Ferdinand Waititu presenting a dummy cheque of KES. 200m to County Executive Committee Member Youth Affairs, Sports, Communications and ICT Karungo wa Thang’wa on Tuesday morning. Kiambu Governor Ferdinand Waititu has this morning launched the Kiambu County Jijenge Fund. This is one of the flagship programmes of the Governor aimed at promoting and developing new and existing micro and small businesses among youth, women, people with special needs and the vulnerable men and women. Speaking during the launch, the Governor promised to increase the fund which has an initial kitty of KShs 200 million with KShs 100 million every financial year. 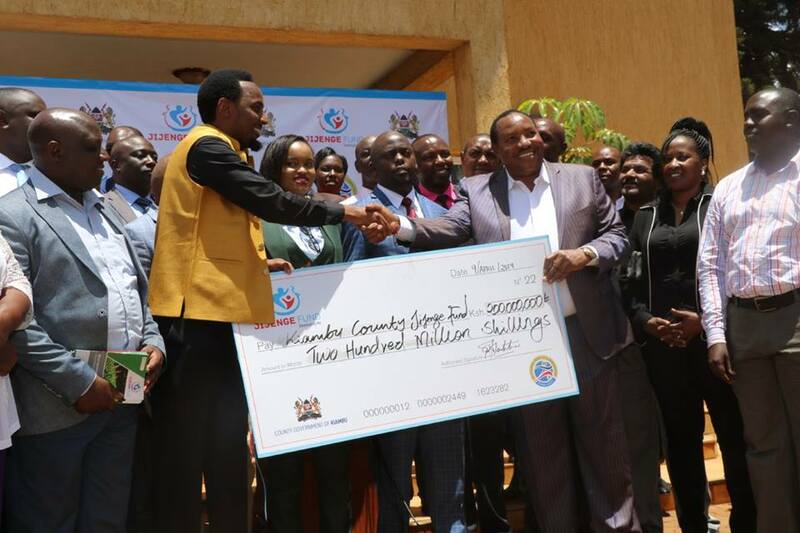 “Jijenge Fund is a revolving fund with no interest and it shall provide financing for LPOs, groups and individuals, I am going to increase it every financial year to ensure that the highest number of Kiambu residents benefit,” he said. The Jijenge Fund is only eligible to Kiambu County residents. County Executive Committee Member Youth Affairs, Sports, Communications and ICT Karungo wa Thang’wa has said that the disbursement of the fund shall kick off immediately. Those with previous loans have been advised by the Governor to visit the department of Youth Affairs, Sports, Communications and ICT to discuss on a favorable repayment plan.